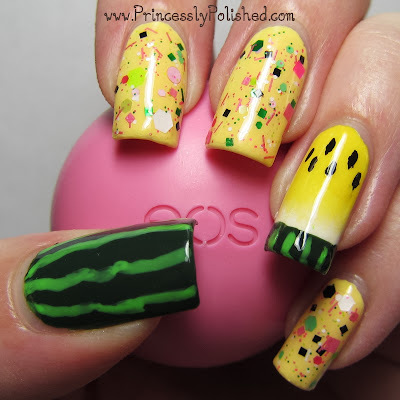 Princessly Polished: Laquerlicious: Melon Sorbet with Watermelon Nail Art! Laquerlicious: Melon Sorbet with Watermelon Nail Art! It's a fruit, it's a vegetable. 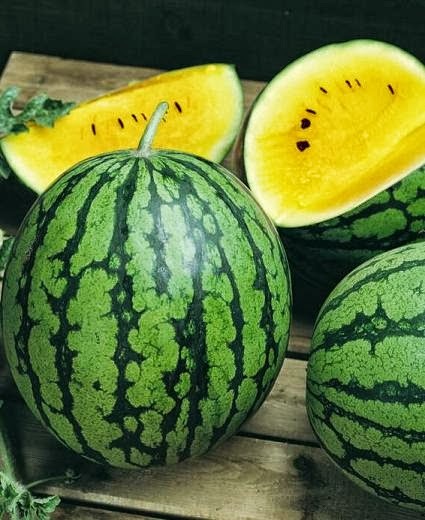 It's not technically a melon. And when it grows without the red pigment-giving antioxidant lycopene... it comes in the most lovely shades of yellow! I must admit to feeling quite clever about remembering that yellow watermelons are indeed "a thing". You see, I've never actually found one in person. They just aren't common in our area. I'd love to try a slice, though! They sound like they taste fantastic... Anyway, nail polish, yes. Laquerlicious Melon Sorbet is such a fantastic glitter topper. I mean, just look at this macro! It is full of satin and matte shapes in happy shades of pink and green, along with a dash of black and white. It's the perfect blend of color variety and glitter sizes, easy to work with, and has perfect topper coverage at one coat. Each nail ends up looking totally unique (without looking chaotic) and there is no need to do glitter fishing. Though I did fish out the pastel pink circle for my index nail - I saw it in the bottle and I wanted it! I could go on, but that would probably be cruel. Right now this polish is on clearance, and there aren't many bottles left. I'll just say that if you missed this one, I feel very sorry for you. Melon slice accent nail: Lemon Fizz base with China Glaze Happy Go Lucky sponged at the cuticle for a riper, sweeter-looking melon, black seeds using a nail art striper (L.A. Colors Black), and Zoya Purity sponged at the tip for a realistic fade into the rind..
Melon rinds: Base color is Zoya Hunter with squiggly lines done with a bright green nail art striper (L.A. Colors Mint Green). I'm a nail-art novice, so I am really happy with how these turned out! I actually wore these nails at the end of last month; editing the pictures now and seeing them again made me happy all over again! It's only summer for another week, so it was a perfect time to get my melon on. Haha. Melon Sorbet looks great over this yellow! Loving your nail art as well.